If you have a smartphone or tablet, there are a wealth of money-saving app available to help you be a smarter shopper and get the biggest bang for your buck. 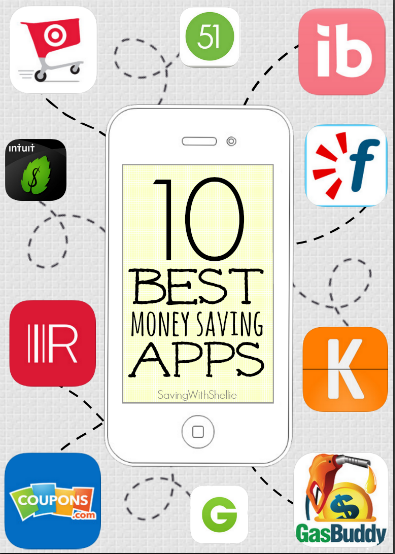 Besides games for my kids, money-saving apps are the majority of the apps I have on my phone. I love how easy they are to use and save while on-the-go. Whether you like to save on groceries, clothes or travel, I have an app that will help you. These are my favorite 10 and the ones I use the most. These apps make it easy to find the best deals, get the best prices and spend less. If you shop at Target, you need the Cartwheel App. This is a special app developed by Target for use in their stores. In the app you will find a huge variety of coupons both for national and house brands. You simply add the offers you like. Then the app generates a bar code with all your loaded offers for the cashier to scan. The best part? There’s no need to search and search for things on your shopping list. Just use the bar code scanner to quickly scan your items as you place them into your cart. The app will tell you if there is a corresponding Cartwheel coupon and allow you to add it to your account. This is the easiest way to save big at Target. The Flipp app offers store flyers and weekly ads. You can browse just about any store. With all your favorite stores at your fingertips, you can quickly search for the items you need, highlight the best deals and clip items straight to your shopping list. Plus with so many stores offering price matching these days, having all the ads at your fingertips makes getting the best deal a piece of cake! With iBotta, you are able to save money on products you buy on your regular shopping trips. If you are can combine the savings with a sale and/or coupon, you are likely to get the product at over half off…and sometimes free! To earn the money back, you must photograph your receipt and scan the barcode to the product. Once the purchase is verified, iBotta will put the money into your account which can be withdrawn via PayPal once you’ve reached the $5 minimum amount. Favado will help you discover the BEST sale and coupon combinations each week for your local grocery, drug and big box stores. You’ll find the freshest sale data from the weekly ad, and if a sale item also has coupons available, Favado will tell you where to find them. This can save you up to 70% – that’s $400 a month for the average family! Money saving experts across the country hand select the very best sales of the week, including “secret” or unadvertised sales, from more than 66,000 grocery and drugstores nationwide, and add them into Favado — now the very best deals are right at your fingertips! This is my favorite app for saving on flights and travel. Enter you flight information on Kayak and they will scour all the airline and travel sites to find you the very best deal. You can toggle your search to show shorter layovers, red eye flights, non-stop and more. You can also set fare alerts and see deals for flexible travel dates. The best part about Kayak is that it takes you directly to the airline or third-party booking site that has the deal. This way you don’t pay booking fees and can still take advantage of frequent flier programs. This handy application can help you find the best prices on gasoline in your area. Even if it’s just a few cents difference, the savings add up over time. It is perfect for budget travel, as you would likely not know where the best gas deals are when in an unfamiliar city. If you aren’t familiar with Groupon, this is a site that lets you purchase vouchers for local events and activities at discounted prices. You’ll find everything from Zoo and museum visits to yoga class to spa and salon trips. Download the app and have Groupon at your fingertips. You can quickly check if there is a Groupon available before visiting a local attraction. Or easily redeem purchased vouchers without printing them out. The Coupons.com app is a great way to be able to print extra coupons. If you regularly print coupons from Coupons.com you know that they have a print limit of two coupons per computer. If you download the Coupons.com app and setup your printer, you can print additional coupons from your phone or iPad. You can also find in-store retail coupons for some of your favorite stores. Just show your phone to get discounts at retailers like Gap, The Body Shop and Lord & Taylor! RedLaser is an easy-to-use barcode scanner. When you are shopping in a store you can scan items and compare prices. Each price comes with a link to the competitor’s website. This makes it easy for you to price match when you are at stores like Target, Walmart and Best Buy. This is an especially great option for buying big ticket items. All of these apps are completely free to download. There’s no reason why you shouldn’t grab them and give them a try. If you have other favorite money saving app, please leave a comment and let me know which ones are your favorites. I’m always looking for new ones to try! Thanks for the suggestions . Have you tried shopkick? This app is awesome you walk into certain stores the app tells u which ones and you can get points just for walking into that store and some places you can even scan items and earn points doing that. You don’t have to buy a thing . You redeem the points for gift cards. Target, Starbucks , sephora , gas cards, just to name a few. And they tell you how many points you need for for each item and how much it’s worth, $5, 10, 25. There are a few items that are not gift cards also. It’s all totally free, I think it’s just the stores way of advertising and trying to get you buying products. But don’t need to buy the products to earn points. Are all of these apps useful in Canada or the US? Or both? I believe most are only in the US. Sorry! I have zero luck with Ibotta, but I almost always do well with Checkout 51.